The story of how South Korea escaped from the park of poverty-trapped countries including Uganda in the nineteen sixties and seventies, is one that attracts considerable anger and envy among many Ugandans. But over the past six years, the secrets of South Korea’s development miracle, has been uncovered through speeches, visits, and demonstration exercises at national and village levels. South Korea’s embassy in Uganda has been at the forefront of leading this learning exercise by organising visits to their country, supporting institutional development all in an effort to inspire Ugandans to learn from their past. Last Wednesday was one of such meeting. A delegation from KOTRA – the Korean government agency responsible for promoting trade and investment in Korea was in the country to meet with Uganda’s business community. 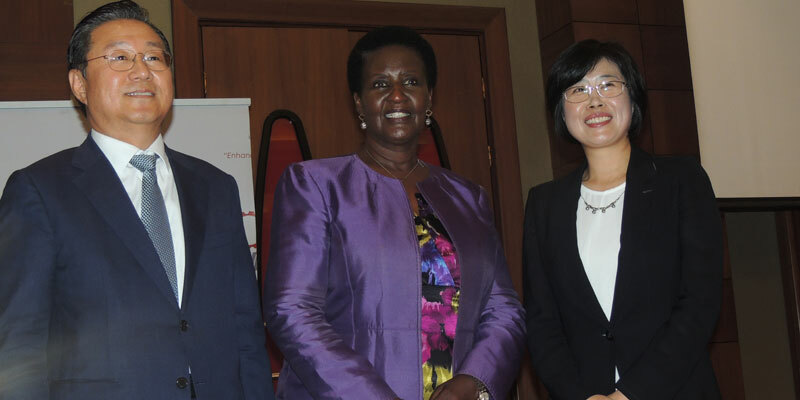 According to Ambassador Park Jong Dae, the South Korean envoy to Uganda, besides persuading Ugandans to invest in Korea, the delegation has the mandate to facilitate investment and trade with Korea. Although Korea’s rapid transformation has opened a wide gap in the economies of both countries, if you were just to compare the global reputation of Samsung and Uganda’s coffee, one would think that we stand no chance to compete with the Asian tiger. Alas, Ugandans were comforted by the fact that they can still make money from Korea just by perfecting what they do best. James Mututa, an information assitant from State House and who has been to Korea revealed that Uganda can make money by exporting some of its highly acclaimed fresh fruits such as Pineapples, and Bananas to the Asian country. Mututa noted that although Korea is internationally renowned for producing fruits and other vegetables with advanced technologies, the taste of Uganda’s fruits is unrivalled and can thus attract significant market in Korea. But he warned any prospecting Ugandans to work on quality before they can even venture of entering the Korean market. He termed the Korean authorities as extremely strict on quality. Citing agriculture as the sector in which Uganda should invest her money and efforts, Ambassador Park, called for the revival of cooperatives as engines of boosting production but also for ensuring high standards of quality. Unlike Uganda whose doors to foreign investors and traders is one of the most widely open, in the world, entering Korea is not a smooth sail. This was revealed by Dr. Florence Muranga, the Head of the Presidential Initiative on Banana Industrial Development (PIBID)’s flagship entity on banana value addition. Muranga revealed that she had to use an agent based in the UK to export her flour derived from Matooke to Korea. According to Muranga, the advent of Kotra, is a welcome development that could help open up the Korean market for Ugandans. Besides ensuring the highest standards of quality for exports, the debate was coloured by comments on how to replicate Korea’s development strategy. Ideas such as focusing on vocational education, hard-work and cooperation among members of the communities were cited as fundamental steps in creating a working culture that can turn villages into factories. Dr. Andrew Kiggundu, an agricultural scientist and one of the lucky Ugandans who have toured Korea to witness the country’s rapid transformation, also notes that Korea focused on producing a few products in which they knew they were the best at than other countries. Citing citrus as one of those commodities they focused on, Kiggundu says that Korea made sure it perfected every aspect of the crop’s value chain. “The end result is that they exported the best fresh oranges to the international market as well as an assortment of products derived from oranges,” observed Kiggundu. He argued that Uganda can choose to produce something they are best at than anyone else, perfect it and use it as a stepping stone to achieve money to invest in other sectors.